Proper tree pruning can take some effort but the benefits to your tree are significant. On this page you will find information about the benefits of properly trimming and pruning your trees. Consistent proper pruning is a key part of tree preservation and can help your tree provide the most benefits over its lifespan. Key tree trimming benefits: Healthy, well pruned trees can provide maximum benefits with the least risk. Pruning to train your trees structure increases safety. 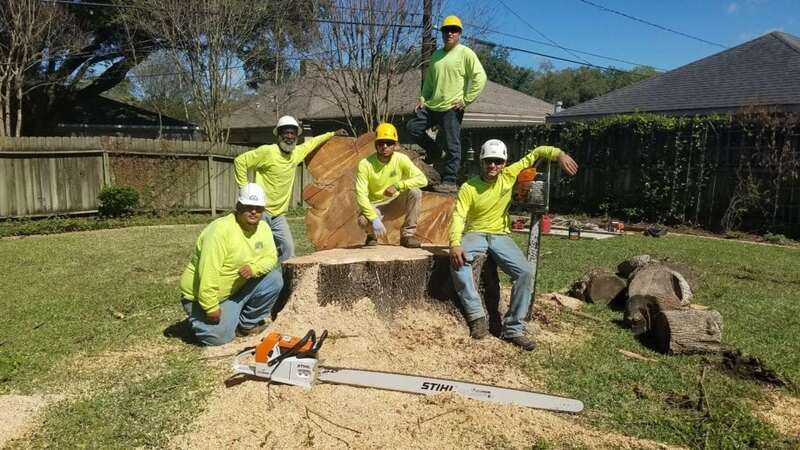 One of the most important tree trimming benefits is training your trees structure. 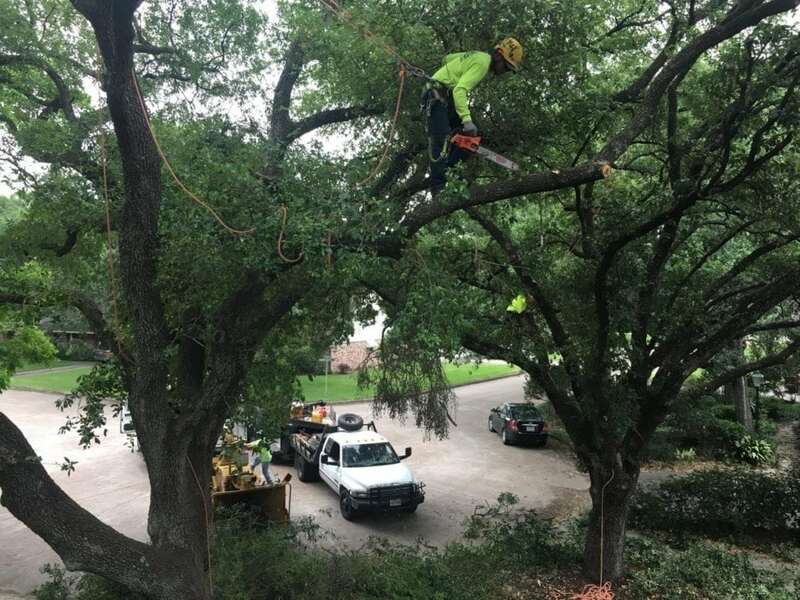 The pruning work that is done during a tree’s adolescent years can have lasting effects on overall strength of branches and stability of the main trunk. In the adjacent photo you will see a tree with multiple co-dominant stems. Co-dominant stems are a good example of tree defects caused by improper pruning. 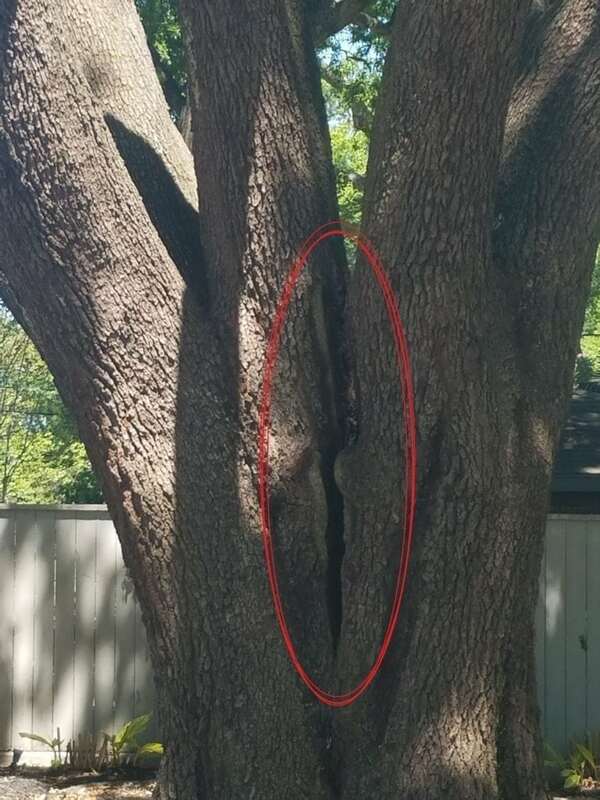 Read more about tree defects caused by improper pruning. Defects in trees such as co-dominant stems can mature and lead to critical failure of the branches and main stem of the tree. 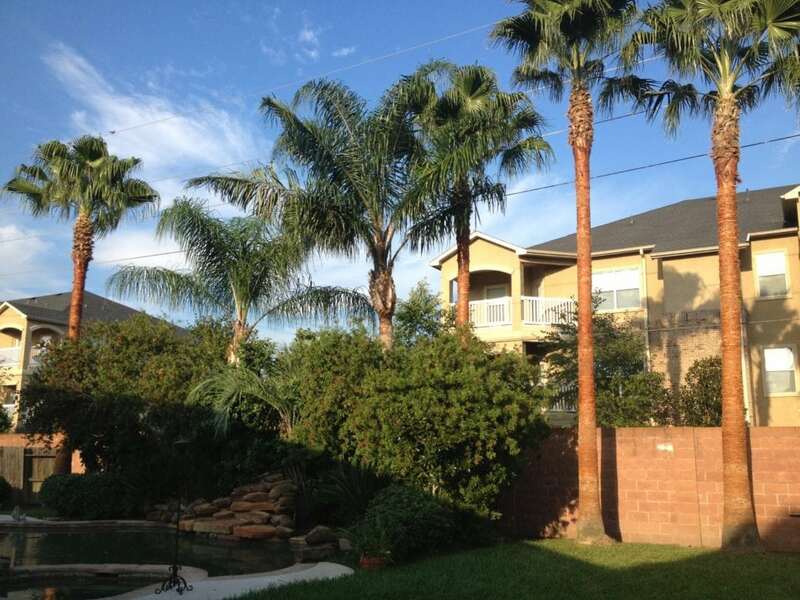 In urban areas such as a residential neighborhood large trees can span over multiple properties. Proper pruning would have removed this poor structure early in this trees life creating a much safer tree. It is critical that young trees be pruned properly to set a solid foundation for strong and well balanced growth. Get <the right amount of> healthy growth from your tree. 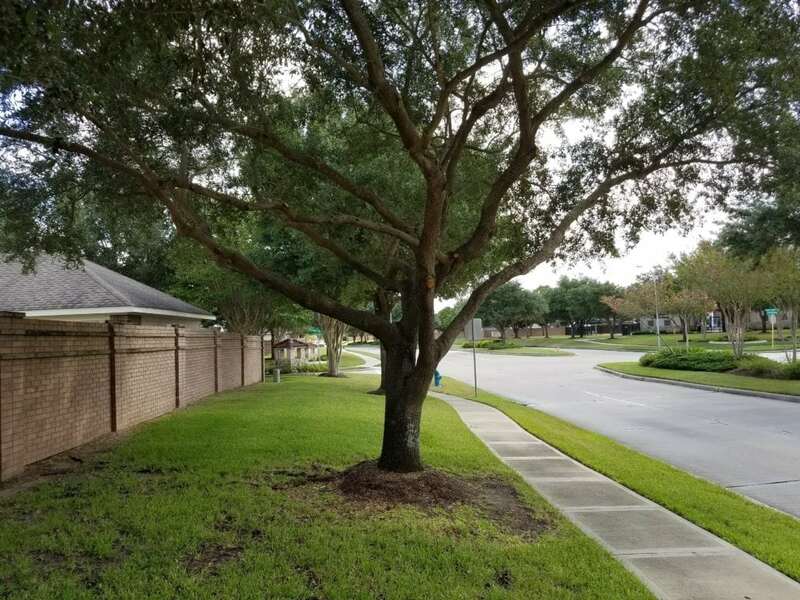 When trees are young everyone wants the tree to grow as fast as possible but eventually most trees begin to outgrow the available space of a residential yard. Healthy trees do grow more quickly than stressed trees but if improperly pruned a tree can begin to exhibit problems more quickly. Trees that are properly pruned over their lifetime will waste less energy and generally be more resistant to pest and disease. Over pruning a tree is one of the fastest ways to stress a tree. The leaves are the food factories of the tree. Trees make an investment in energy to grow new leaves so they can in in turn transform sun energy into sugars for the tree to survive on. If trees are improperly pruned they can become energy deficit over time leading to decline in health. Over thinning a tree even a little will cause excessive growth to occur as the tree tries to replace the lost food production. New suckers are the result and an unattractive messy looking tree are the result. Furthermore suckers do not generally have the good characteristics of the original branches and further complicate keeping a good structure. Key tree trimming benefits: Proper pruning promotes a moderate but healthy amount of growth that keeps your tree healthy and easier to manage. Make your tree compliment your home perfectly. Let’s face it, most trees eventually outgrow their space. Even small species trees can eventually become larger than the place it was planted. If you own trees you are guaranteed to experience you trees encroaching your home and taking over your yard. Properly trimming your tree can provide the great benefit of getting your yard back! In addition to being more safe and healthy a properly pruned tree will prevent encroachment and damage to your home. Key tree trimming benefits: Proper pruning helps your tree provide shade and other benefits while not taking over your property. Proper pruning cuts help to prevent pests and disease in trees. 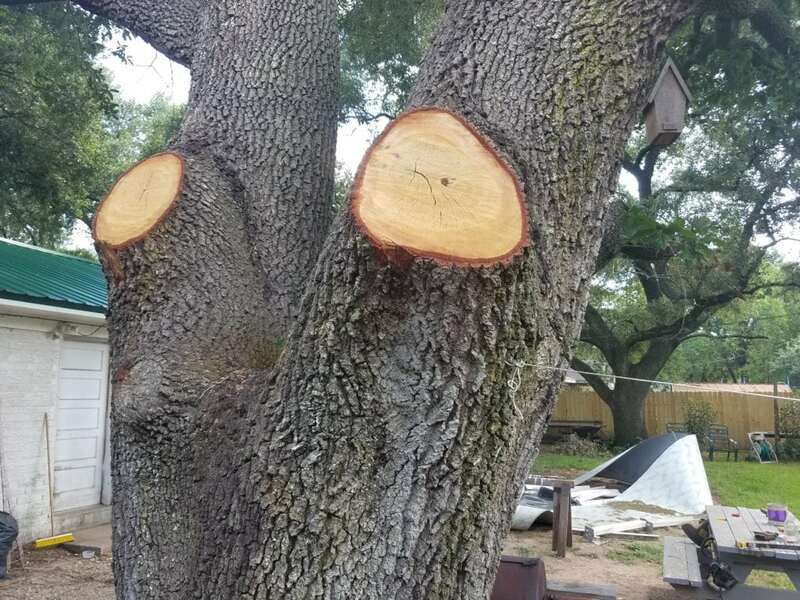 In this photo there is a live oak tree with large pruning cuts. Proper pruning when this tree was young could have prevented the need to remove very large branches. 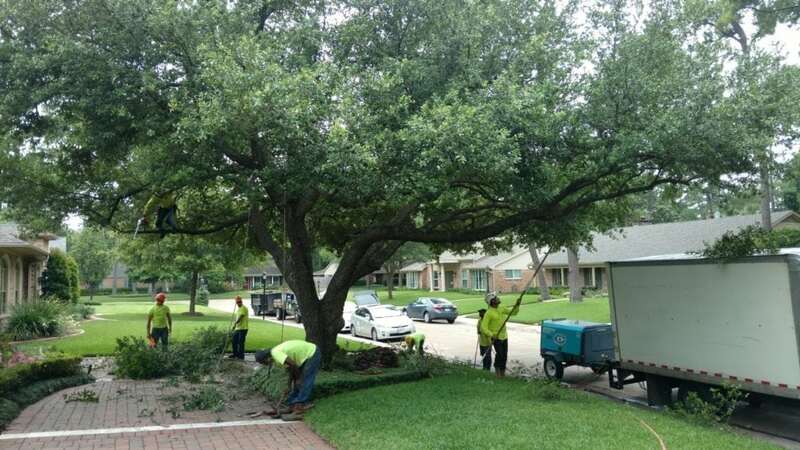 Sometimes the need to make major changes to a tree can not be avoided. The main issue with large cuts is that they take a long time to heal leaving the tree exposed to pathogens. Making a proper cut is important on all trees but this is especially so when large cuts are being made to mature trees. Key tree trimming benefits: Proper pruning cuts reduce spread of disease. Proper pruning can keep your grass and other landscape plants alive. 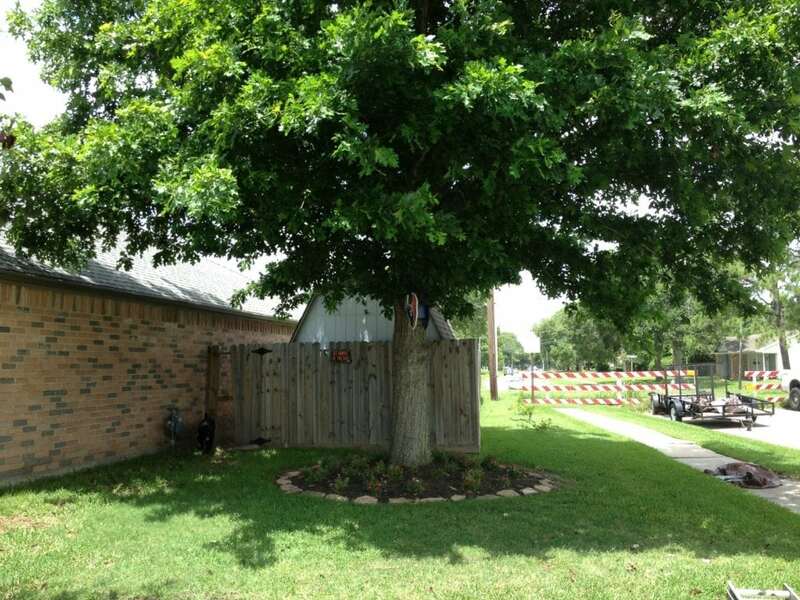 One of the most common problems homeowners have is that their trees shade out and kill their grass. 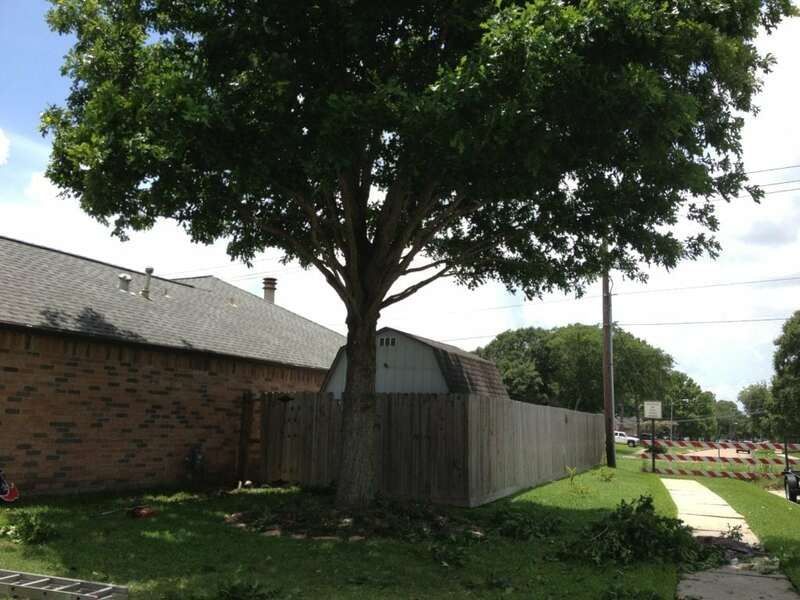 This can be an exceptionally difficult problem in properties that have multiple large trees in the same area. Turf grass and trees do not occur together in nature. It’s a competition between your trees and your grass and in most cases the trees win. Proper pruning helps to get light through and under the tree in a way that does not cause excessive stress. Key tree trimming benefits: Proper pruning helps to save your grass while keeping the tree healthy at the same time.